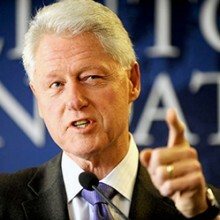 Bill Clinton served as the 42nd President of the United States. During his tenure, Clinton presided over the longest period of peacetime economic expansion in U.S. history. From war-torn Bosnia to the Battle of Mogadishu to Saddam Hussein’s Iraq, he continuously played a pivotal role in international affairs. Prior to his presidency, Clinton was elected Arkansas Attorney General in 1976 and Governor in 1978. Heavily involved in humanitarian work, Clinton was named UN Special Envoy to Haiti in 2009 and has also founded the William J. Clinton Foundation. His most notable projects include the Clinton Climate Initiative, which fosters research to combat climate change; the Clinton Global Initiative, an annual meeting of world leaders to discuss global issues; and the Clinton Foundation Haiti Fund, dedicated to rebuilding Haiti in the aftermath of its devastating 2010 earthquake. Bill Clinton continues to be active in public life, fundraising for and founding charitable organizations. In 2001, he was presented with the Medal for Distinguished Public Service by Secretary of Defense William S. Cohen. In 1993, Clinton was selected as Time magazine’s “Man of the Year”, and again in 1998. He is also the recipient of the J. William Fulbright Prize for International Understanding and, along with former President George H. W. Bush, the International Freedom Conductor Award, for their help with the fundraising following the tsunami that devastated South Asia in 2004. Most recently in 2011, Bill Clinton was inducted into Irish America magazine’s Irish America Hall of Fame for his crucial role in the Northern Ireland Peace Process.